This is a post from September of last year. Three weeks after I originally wrote this, Rocky died. The amazing thing for this exceptional animal was that he passed away peacefully in our home right after we all said goodbye that night and the very day before my mother-in-law moved in. His illness would have made a difficult transition for her even more trying. I cannot believe how much he is still missed. The good ones always are. I think I made you sick after you showed up on my blue canvas. A painting I patted myself on the shoulder for. I’m so very sorry, my dear friend. Did I do that to you? And it is too late now. I can take nothing back. Not one thing. I should have castrated my selfish fingers. You were saying you were sick. I didn’t hear your silent words. I wasn’t listening. For two months, I think it was two months, I can’t remember exactly–I was buried in my meaningful life. You kept hanging around my studio. You hadn’t ever done that before. Well you had, but not to stay. You’d give a gentle hello then return to your usual places, ones of comfort like the sofa by the piano. We called it “your bed,” not our couch. Actually it was a love seat. The couch knew more than I. It knew how to comfort and be there accepting the additional weight of the masses spreading inside you. The casual invaders I’d grown too busy to notice. And now, I watch your chest breathing up and down. It is your heart saying goodbye. I’m listening now my friend. I am listening now. Please forgive me when I must say my final goodbye to you and mean it from the depth of my selfish soul. 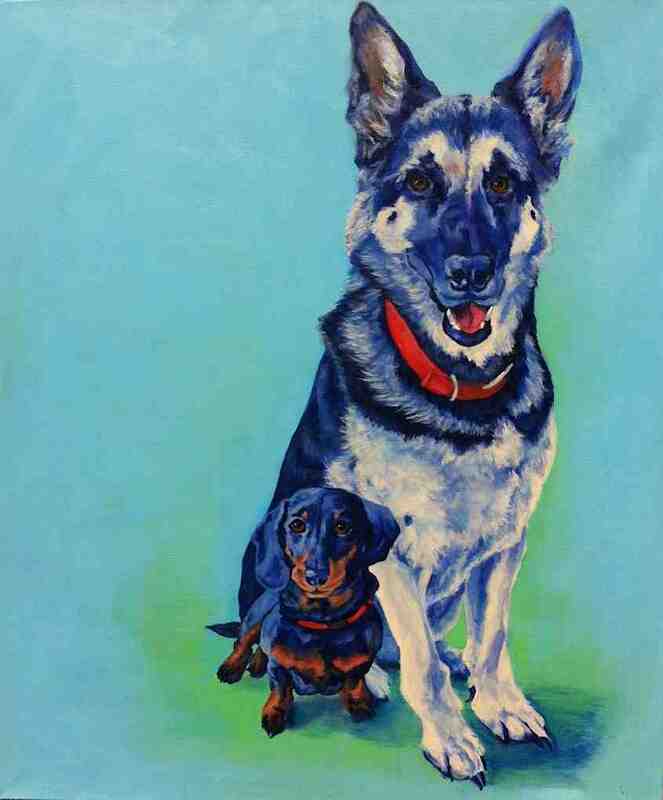 This entry was posted in My Art & Writing and tagged art, cancer, Dachshund, death, dogs, friendship, German Shepherd, GSD, health, love, musings-thoughts, pets, portrait, posts, sadness, studio. Bookmark the permalink. I can empathize. My wife and I are dog lovers, and we’ve been through that three times over the years. Take care. I’ve had many GSDs – this one, Rocky, was really very special to my family. He is still sorely missed. These darn animals! I am crying. I’m sorry I missed reading this last year. Beautiful painting.